“TEK Industries announced the release of its newest RFID hardware package: TEK Mousemat. This revolutionary,”Plug and Play” RFID scanner is packaged inside a mousepad. 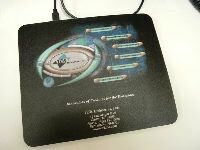 Measuring 9.25″ by 7.75″ with an integrated antenna, the TEK Mousemat interfaces with a desktop, laptop, or Pocket PC, via a USB connection, making it portable and adaptable.